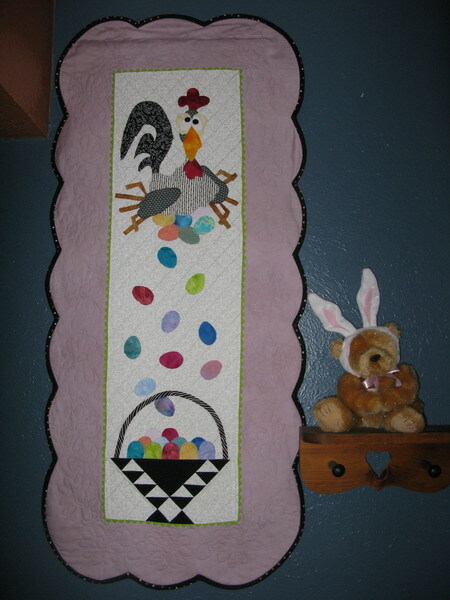 What better way to celebrate, than with "Esther, the Easter Chicken"! For those of you who are "Quilt Show" members, Carolyn Hughey was generous enough to share this adorable little pattern with us. I just had to get it done for the holiday. Is that a face only a mother could love!!!! Scalloped edges was a first for me, and I have a long way to go, but it was a fun little personal challenge. It's still not too late to get this little gal done for Sunday! It will surely bring many smiles. Check out the new button on the left side of my blog. Another Little Quilt Swap4. 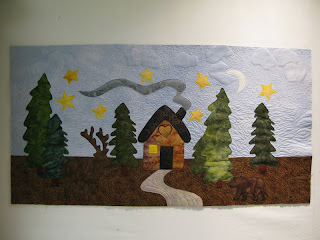 What a great way to swap with many quilters across the globe. Read up on the Rules and see if it's for you. I can hardly wait to start my project. May the weekend bring a wonderful Easter for you all. If you live on the East coast, I sure hope it stops raining soon. It looks like it went right from snow to rain. There has to be a break in sight soon! Keep as dry as possible! Wow all the wonderful new toys for blogging, made me want to give my home a little face lift. The tech-ie that I am "not" took a good part of the day to accomplish this, only to find that I was really trying to make things harder than they really were. Ah the joys of an old mind! :-) Kids would have had this figured out in about 10 minutes! I've been on vacation for a couple of weeks, so I really didn't get much sewing done. I took 2 quilt tops to work on, only to mail them back never having been touched. I did some shopping for fabrics for 2 more quilts and a backing, so needless to say my luggage was very overweight, hence the mail option. Delta has made that second bag fee so steep that the Post Office is a bargain anymore. The lodge my son works at, moved their office this winter and were in need of a curtain for a closet. We decided that a topper was in order, so I took up this, to see how it would work. They seemed very pleased with it so I bound it and made up the curtain while I was up there. This was adapted from the book "Toppers" from Possibilities. The idea is, that you can make 1 quilt and then make up mini quilts and toppers to lay across the pillows or foot of your bed and change them out for seasons or themes. I bought the book many moons ago, and it surfaced when I was looking for something with a lodge look. It got me to thinking, what a great idea that really is. 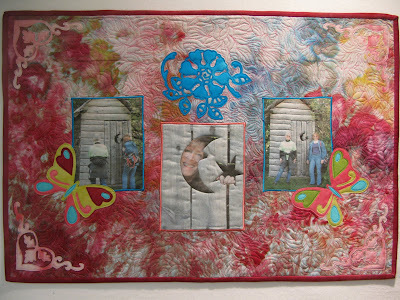 There are just so many full size quilts that one can use, but we always want to update and change things out. The economy is tough right now, so what a great way to be able to keep quilting, keep a budget and have new and fun projects we can work on then put on our beds. I am going to be doing some serious thinking on this idea. I love changing things out and what a great way to do it! Hope your day holds visions of projects dancing in your head! Oh wait, that's sugar plums and another holiday isn't it??? Regardless wishing you inspiration and time to complete those things you dream. If you can add a glass or two of green beer, what could be better. Here are a couple of little projects I have done myself for the special day. 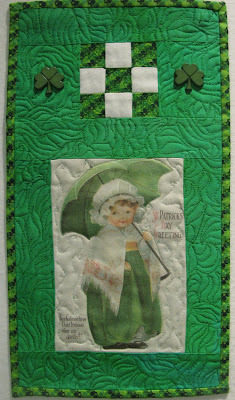 To the left is a little Irish wall hanging using wonderful images of antique post cards. 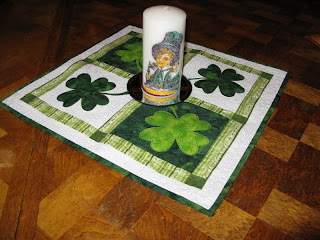 Below is a table runner that I mailed off for our St Patty's swap with the Quilted Table group. The candle is one of those things I dreamed up one day. I embroider a design onto a heavy tear away then attached it to the candle with a spray adhesive. I am pretty sure it really isn't all that safe to burn, but it sure makes for a fun decoration. I found a great way to use some of my favorite "Snow Dye" fabrics. In wanting to make up a quick little gift for my friend in Alaska, I was able to combine the fabric with some fun appliqués and photo transfer to come up with this little wall hanging, as a memory of last summers play time in Homer. What you can't see, is the look on my son's face as he patiently awaited (or not so patiently) for his idiot mother and her friends to stop embarrassing him with the outhouse photos. Ahhhh, the joys of motherhood when you finally become an embarrassment for your children. Such a treat for the shoe to be on the other foot for a change!!!! Oh yeah focus here. Back to the topic. The color runs in the fabric made for some great play time with free motion quilting too. I can hardly wait to do a little more playing with these fabrics, as this little project has opened my mind to a million ideas. As I sit here in Alaska and watch the snow fall, I am so very sorry I didn't ship up my fabric dyeing supplies as I considered. They have lots of fresh new snow that would be perfect for fabric dyeing. Oh well next time I guess! Happy Stitching! There is really nothing like coming home to find a beauty like this in your mailbox. 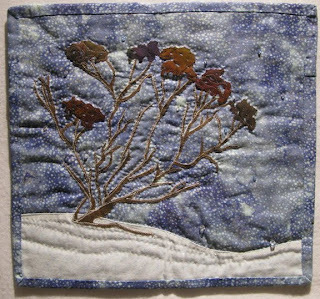 Melody in Florida sent me this absolutely gorgeous Winter Mini Quilt. She designed it herself and I have to tell you this photo does NOT do it justice. It sparkles and she has used glow in the dark thread, so at night it is just awesome to look at. Swapping with all these wonderful quilters has been so enriching for me. I am always thrilled when another swap finds it's way to my mailbox. Melody you can't imagine how special I feel becoming the new owner of your wonderful treasure. I will take good care of it for you and you can bet I am going to brag to everyone I know that it's mine, all mine! 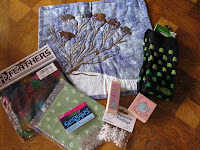 :-) If you want to join in on our wonderful swaps, Quilting Gallery.com is the place to visit. I also participate in the Quilted Table Yahoo group. Check these both out, you won't be sorry! Now, dare I brag that in addition to the incredible "Quiltie", Melody also sent me all these wonderful toys! Wow Melody, I feel like I won the lottery! I can never thank you enough! 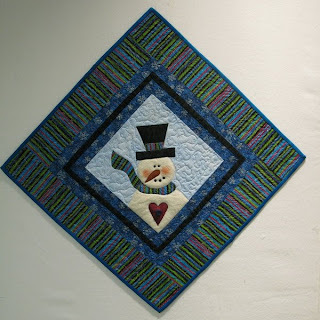 I was able to breath a sigh of relief that Cheri, the new owner of the mini quilt I sent off was happy with her "Snowman" that I sent her. It is so tough when you mail off something. You just hope that your work is good enough, or that the colors are something they will like, etc, etc. Why is it that we all are so critical of our own work, and fall in love with everyone elses????? Now there is a thought to ponder this week! 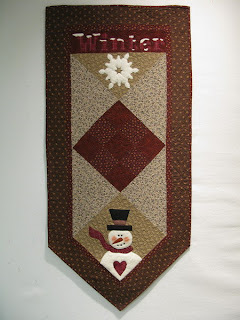 Remember the free pattern that Harbour Quilting Company had in January? Well, I finished up these little projects this past week. I decided to play with color and was delighted to see how different things look when you change your color palette. I dug thru my stash and came up with these two very different versions of the same pattern, changing each a bit from their original design to accommodate a wall hanging I wanted and a square table mat instead of the table runner. It's really quite fun to take a pattern and make some minor changes to it. You will find that it is really very easy and it can open many doors to your creative spirit. As for myself, I tend to want to over think things, and that is definitely a lock on the door. Just sitting down with no plan, a pair of scissors and a rotary cutter is my best option. Grab some stash and a pattern you love and give it a try. You might just amaze yourself!